Tourist-Channel Slovakia - Bánovce nad Bebravou Tourist-Channel Slovakia: New homepage! Archeologists consider area of Bánovce upon Bebrava to be one of the Slav organisational centre in the 9th century. The first written mention from the year 1232 is in a deed of donation of the Hungarian king Ondrej II. Hodslav. Bánovce was awarded town privilegs sometime before 1378. History of the town is connected with a big Hussite expedition to Slovakia in the years 1431-33 and with Turks maraud in the year 1633. In Middle Ages Bánovce became an important centre of technical production as well as shoemaking, clothmaking,blacksmithing, butchery, locksmithing, carpentery, cooping, weaving and tailoring. In the beginning of the 17th century there was founded a school for providing basic education. From monuments of the town there is the most important the Church of St Nicolaus in local cemetery from the 15th century, the former Gothic and later Renaissaince and Baroque adapted, the Church of Holy Trinity in the middle of the town from the year 1802, the Classicistic monastery in Horné Ozorovce from the year 1817, a house, where Janko Jesenský - writer had lived and composed, statue of Ľ. Štúr with a stone figure relief. Not far away is Uhrovec - birth-place of Ľ. Štúr and A. Dubček (in their native house was constituted museum) and rests of the Romanesque castle of Uhrovec from the 13th century. In Bánovce upon Bebrava were born or acted many representatives of science and art: Anton Ďatel, Ján Nepomuk Rosinský, Jozef Rosinský, Juraj Ribay, Oľga Hanáková, Janko Jesenský, Adam Škultéty, Mária Ďuríčková, Elena Čepčeková, Rudo Móric and other. There are very attractive in addition to cultural monuments already mentioned a summer thermal swimming pool Pažiť, a roofed swimming pool with thermal water, a water dam. In surroundings there are localities for tourism, for going mushrooming and hunter´s areas. 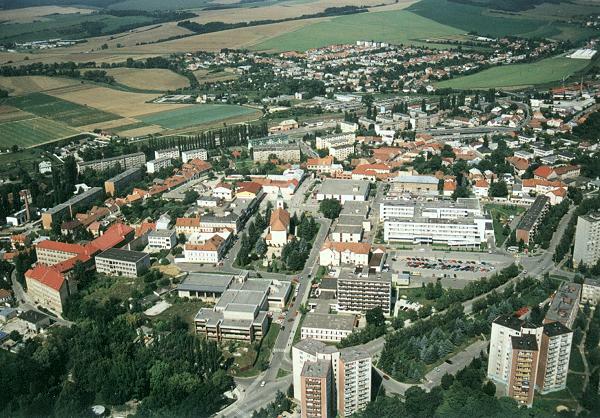 The town is situated at the main connecting point of magistral between Morava and Central Slovakia and therefore there are connections with the Czech Republik from whole Slovakia. Accommodation: the Kanada Hotel and the Arkádia Hotel, the ESO - motorway restaurant. Town as a seat of district has very good perspectives to future, it is realised individual house construction and continued in construction of blocks of flats, it is increased and diversified shopping network thanks to private businessmen. In this area there are varios institutes.